British Standard BS 10 : 1962 - Specification for Flanges and Bolting for Pipes, Valves, and Fittings. 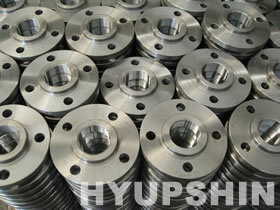 This covers plain, boss, integrally cast or forged, and welding neck type flanges, in ten tables. Although BS 10 is obsolescent, it remains in use for the dimensions of light duty, economy stainless steel flanges in applications where corrosion resistance and/or hygiene, rather than high pressures and temperatures, are the primary considerations. The following tables detail the applicable standard dimensions from Tables D, E, F and H of BS 10.